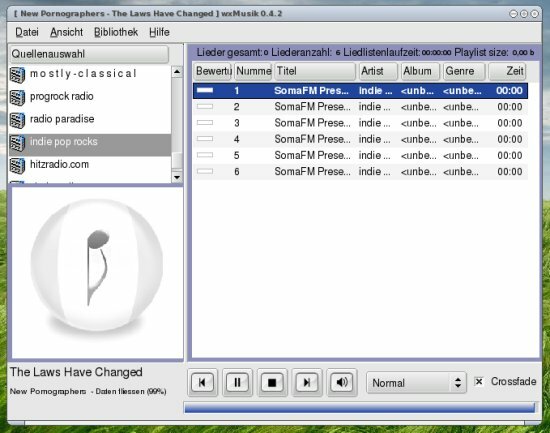 Allows to manage your music in albums, also radiostations are supported. You also need some playlists. I made an extra-Dotpup, so you later can install newer version of wxMusic, but keep your old playlists. The wxMusik-source has detailed instructions on how to proceed. The "Mac" - libraries are available for Windows only, so I deactivated them. The muse -libs I compiled, but did not know what to do with the resulting files, there were just binaries, no libraries. So I deactivated them, too. Finally I upxed the binary. I just installed this. I like it - it's great! I'm not sure what happened but at first it wouldn't play any songs, even after I set up a music library. But then I installed your wxMusik-0.4.2-playlists.pup and now it's all OK. Thanks for this. Another winner. I updated the links in the first message, should work now. Thank You very much MU - wxMusik is working flawlessly. I've tried xmms music box already - it's ok, but wx is more suitable to my needs. MU, trying to understand the widgets you compiled... downloaded the tar file, unzipped it, and am trying to work out what you mean. You configured this for...? Is it to have widgets with wxMusik? Can you add wxMusik to these widgets? Do I follow the compile instructions in the tar package, or yours from the post... happy to give it a go, unsure what to do, and also, what you did it for. Can you please explain a little more? Thanks! Realized wxWidgets was the program you needed to compile wxMusik... am just realizing how much work you must have put into that...lol. Thanks. Am using it as a default music player for TigerPup, it's a great program. Posted: Sat 19 Jul 2008, 05:28 Post subject: Thank you! Just wanted to say thanks for wxMusik- It works great! I actually like it better than Winamp, Windows Media, or JetAudio. It's sweet as. Thanks! Been happily using wxMusik, these last few months. I noticed on wxMusik's homepage they said it was capable of playing wmas. Is there a way I can enable this in Puppy? Thanks! Edit: Sorry my mistake. WMA is only supported in the windows version. Pity. I don't suppose there is a way to enable it is there? I defined a library and select it. I expect then that a search is made to import to the library, but nothing happens whether I choose update or rebuild. Well thanks for the package. Well yes, I misunderstood the panel. The directory to fill in is not the directory where the library should store the info, but it's the directory, where a search for music files is started. I got my music files registered in the library now. Don't know where the library in fact is, but I suppose in /root/.wxMusik. I defined a new stream, which is an .asx one. Can wxMUSIK handle .asx streams?